I did something really hard this afternoon. Resigned from NACIE. Tough, tough decision. This was the letter that I sent to my team and investors. The NACIE team is a group of smart, dedicated, entrepreneurial minded individuals. All there, I believe, with the best intentions. Let’s hope they can get something done with this administration. For my hint ®team, unfortunately, I needed to bow out. 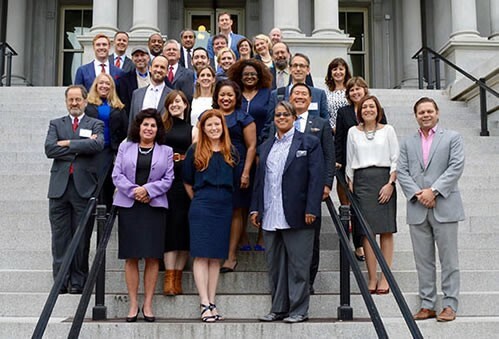 In October 2016, I stood proudly with a diverse group of men and women on the Navy Steps of the Eisenhower Building, beginning a 2 year term as a member of the National Advisory Council On Innovation And Entrepreneurship (NACIE). Our mission was to advise the Commerce Secretary on issues related to maintaining and developing a skilled, globally competitive workforce and on other issues related to innovation. During my first few days at NACIE I witnessed a government that was focused on serving the people of this great country and on helping maintain our competitive edge. I accepted a position at NACIE in order to serve our country, not to serve a particular administration and I intended to serve regardless of who won the upcoming Presidential election. After all, the members of NACIE commit to provide advice that will be helpful to America, not to serve a particular President’s agenda. Under normal circumstances I could have had a chance to help regardless of whether a Democrat or a Republican was in the White House. Today, however, I am resigning from NACIE because I believe that we now have a President that has no interest in advice, that is pursuing power as an end in and of itself and that has no intention of solving real problems or creating real opportunities for the people of this great nation. More importantly, as the leader of an innovative company that’s helping America get healthier, I feel a deep obligation to our employees, our investors and our customers to distance myself from the sexism, racism, protectionism and hate that has defined the Trump administration’s first days in office. Hint is made up of men, women (over 50%), straight people, LGBT people, small people, large people, hispanic people, jewish/christian/muslim people, white people and black people. We are all Americans and we are proud of our country and its values. The last thing that I want to do is have you think that I would be supporting an administration that is working against the values that I believe as an American that are the key to entrepreneurship. Founder and CEO of @hint. Drink water, not sugar.